Manufactured and distributed in 1980, the Rubik’s Cube is one of the timeless toys that never fail to bring nostalgia to anyone every age. After its initial popularity, the puzzle became a source of great frustration for the people. This led to a decline in interest in the toy. Despite this decline, Rubik’s Cube was one of the best-selling toys in history, selling hundreds of millions during 1981 alone. With the advent of the Internet, people all over the world are now able to share tips and tricks on how to solve a Rubik's cube. People all over the world has also become engrossed in improving solving times and trading of tips and tricks Rubik’s cube solver programs, simulators, and other widgets have also been developed to simulate the state of solving the puzzles. With the increase in the demand for these applications, the demand for programmers and interest to hire full stack developer to develop such apps and tools has also risen. Why Is Rubik’s Cube So Famous? What makes this puzzle such a phenomenon? Rubik’s Cube is an engaging portable mental-exercise tool that everyone can bring anywhere. The puzzle is small, weighs nearly nothing, and stimulates brain activity. In solving the Rubik's Cube, our mental acuity, focus, and problem-solving skills are improved. Hand-eye coordination is boosted the longer it is played. The puzzle also helps with improving spatial awareness, which is the ability to attribute visual patterns and its relation to its surrounding environment. Even better, in today’s age, when one gets stuck, guides and simple solution to Rubik’s Cube puzzles are available online. Methods and algorithms have been developed through the years to solve the Rubik’s Cube puzzle, such as speedcubing solver methods and math-based algorithms. Developed by Jessica Fridrich, CFOP outlines simple steps to solve the puzzle but takes time and effort to master. The methodology of the CFOP is less intuitive and more sequential. Build on the foundations of the first 2 layers of the puzzle. Pair pieces then insert them to the foundations of the first 2 layers. The main competitor to CFOP, Roux adheres to a more intuitive approach in solving the puzzle. Created by Gilles Roux, the Roux approach applies more advanced methods that include block building in 2 of its major steps and draws from “corners-first method”. Developed by Lars Petrus, the Petrus method is unlike the previous methods. The method emphasizes a block-building approach where the first 2 layers of the cube are solved intuitively. This method has 7 main steps, which is fewer in number and far more intuitive in comparison to the Fridrich method. This approach is more of a challenge to learn for a beginner, compared to the other methods. Optimal solutions for solving Rubik’s cube aim to achieve the least possible number of moves to solve any given scrambled state. Numerous research and mathematical applications have been used to develop algorithms with this purpose in mind. These solutions utilize a graphical and mathematical representation of the different states of the cube. They derive a possible pattern or sequences of moves to solve the puzzle from these representations. This algorithm was developed in 1981 by the British professor Morwen Thislewaite. The algorithm applies principles derived from mathematical theories on group theory, which is a method used to understand abstract and physical systems. The algorithm is easy to adapt and program and will be able to quickly provide a short and simple solution to Rubik’s cube state. However, these solutions yielded may not be optimal and need more moves compared to other algorithms. Developed by Herbert Kociemba, this method improving upon Thistlethwaite's algorithm. The method divides the solving process into 2 phases. The first phase of the method needs at most 12 moves to complete and the 2nd move at most 18 moves. IDA* or Korf’s Algorithm was developed by Richard Korf in 1997. The algorithm uses a graph path search algorithm to search for an optimal solution to solve the cube. Korf describes IDA* as an implementation of a depth-first search (DFS) algorithm that searches for longer solutions in iterations. Erno Rubik, the creator of the Rubik’s Cube, took about a month to solve the puzzle. He did this to show people that it is indeed possible to solve the puzzle. In more recent years, technologies such as Machine learning and AI for simple games were developed and improved upon. In 2016, Albert Beer’s Sub1 Reloaded held the record for the fastest robot to ever solve a Rubik’s Cube. Aside from robots, self-learning machines have also established their mark in this community. DeepCube, an AI system, was able to teach itself to solve Rubik’s Cube in 44 hours, with minimal human intervention and using Reinforcement Learning. There are more than 43 quintillion probable combinations to be made in a basic 3x3x3 cube, and only one of these to solve the puzzle. In any random scramble, Rubik’s Cube can be solved with at least 20 moves, a number which is now commonly referred to as God’s Number. What makes Rubik’s Cube such a great problem to solve or recreate using AI or Machine learning technology is the simplicity of its premise and the vast number of possible ways to arrive at a solution. There are many ways to implement algorithms for a Rubik’s Cube solver program. With mathematical approaches such as heuristics and group theory being incorporated into many applications of Machine Learning and AI, solving the Rubik’s Cube has become infinitely easier. 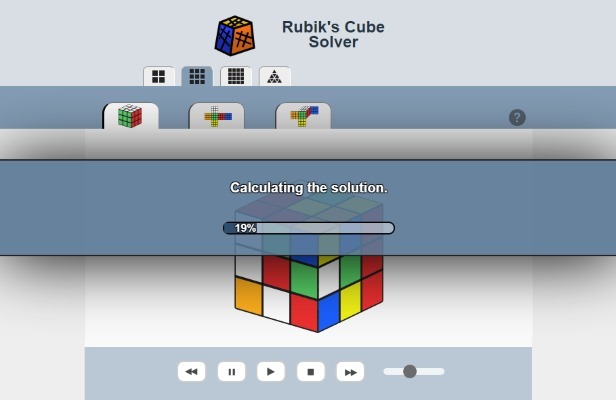 These practices, such as solving the neural-net code to derive an efficient AI-based Rubik’s cube solver program implementation, are no longer limited to research and academic practices but have evolved into the development of apps - both mobile and web-based - that average individuals can use in building their skills.